Are you in charge of accounting for your company and you started to manage all the financial records of the business? No worries, we have the best accounting templates for your situation! When making large purchases for items like supplies, products, machinery, inventory or other equipment, it may be necessary to do so on credit, which can result in multiple monthly payments made to different vendors or suppliers, due on different dates. Using this accounts payable Excel template will help to keep track of what you owe to each vendor or supplier, and will provide a quick look at the total outstanding balances and due dates. This template does also contain an accounting journal for free. Nicely formatted and ready to print. Easy to customize to your business style by SME companies. Feel free to edit and change the formulas to your need. Using our SME financial and accounting templates guarantees you will save time, cost and efforts! 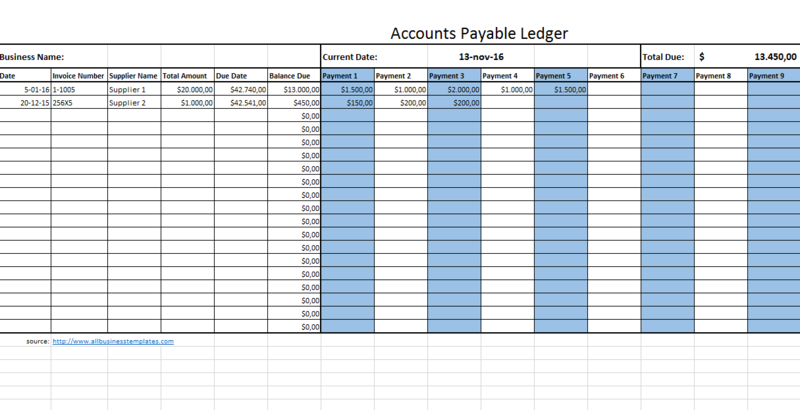 Download this Accounts Payable Ledger template for Small and medium-sized enterprises and after downloading you will be able to customize every detail and appearance and finish it in minutes.